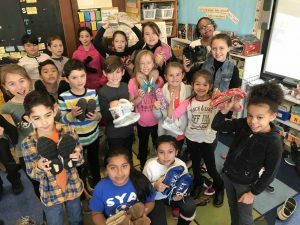 Members of the Southampton Elementary School Student Council are making a difference in the lives of children in need across the globe through a campaign to collect gently used shoes. The shoes will be donated to Operation International, an organization that provides medical and humanitarian aid to impoverished countries. The shoes will be delivered to an orphanage in Ivory Coast, Africa, by a group of local doctors who will soon be embarking on a mission to the area. The project is the third that the third- and fourth-graders have taken part in this school year. In October, the students, led by teachers Lisa Carew and Anne Marie Calogrias, commenced a water bottle collection to raise money for the Women’s Cancer Coalition. They are currently involved in a schoolwide coat collection. The coats will be dry cleaned by Good Ground Cleaners in Hampton Bays and then delivered to Heart of the Hamptons relief programs. “We are really proud of the work our student council members do,” said Carew. Photo caption: Southampton Elementary School students have been collecting gently used shoes for children in poor countries.